Chewy Chocolate Chip Cookie recipe with a secret little ingredient. They are soft, chewy, and amazing! Learn the secrets to the chocolate chip cookies that everyone requests! 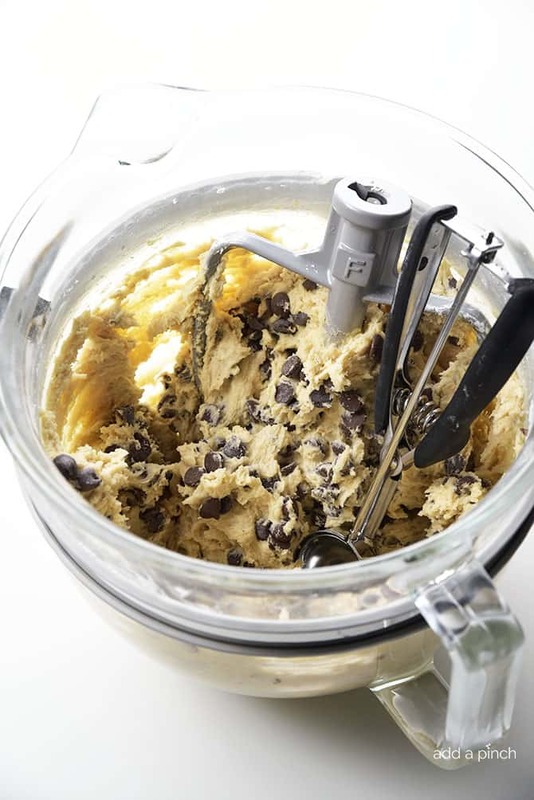 Chocolate Chip Cookies have to be our absolute favorite type of chocolate chip cookie recipe in the whole wide world. But seriously, chocolate chip cookies and milk? I think my son could eat his nine year old weight in them he loves them so much. Last year, we had an experiment to find the perfect chocolate chip cookie recipe and found one that we both loved. 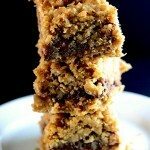 I turned them into chocolate chip cookie brownies and even used them in my recipe for chocolate chip peanut butter doozies that will knock your socks off they are so delicious! But then, just a while back my husband told me he really preferred a chewy chocolate chip cookie. So our adventure started again. We spent afternoons in the kitchen mixing, tasting, baking, and grinning from ear to ear. It’s a tough life testing chocolate chip cookie recipes, isn’t it? But a mighty delicious one at that. Who would have thought that the cookie my family loved the most as a “chocolate chip cookie” has oatmeal in it? But from one taste of the dough, we knew this recipe was different. 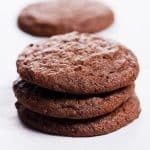 If you like your cookies to be crisp on the outside, chewy on the inside with the perfect combination of sweet and a little bite of salty then this cookie recipe has your name on it, too! Scoop your chocolate chip cookie dough onto cookie sheet and bake for about 8-10 minutes just until lightly golden brown. Remove from the oven and watch them disappear. Here’s my Chewy Chocolate Chip Cookie recipe. I think you’ll love it! 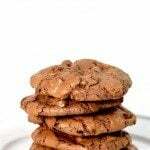 Chewy Chocolate Chip Cookie recipe with a secret little ingredient. They are chewy, soft, and amazing! 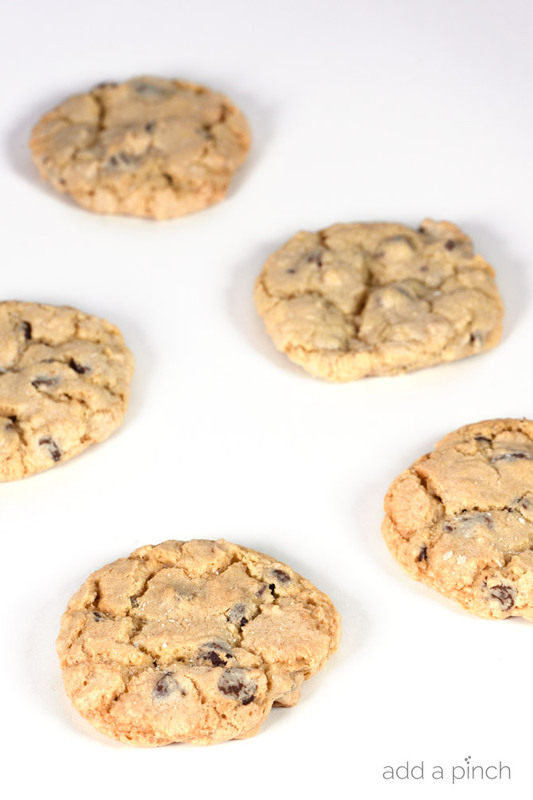 Learn the secrets to the chocolate chip cookies that everyone requests! Cream butter then add sugars and mix until light and fluffy. Add eggs and vanilla. Mix until well-combined. Add flour, oats, salt, and baking soda to butter mixture. Mix well and then stir in chocolate chips. 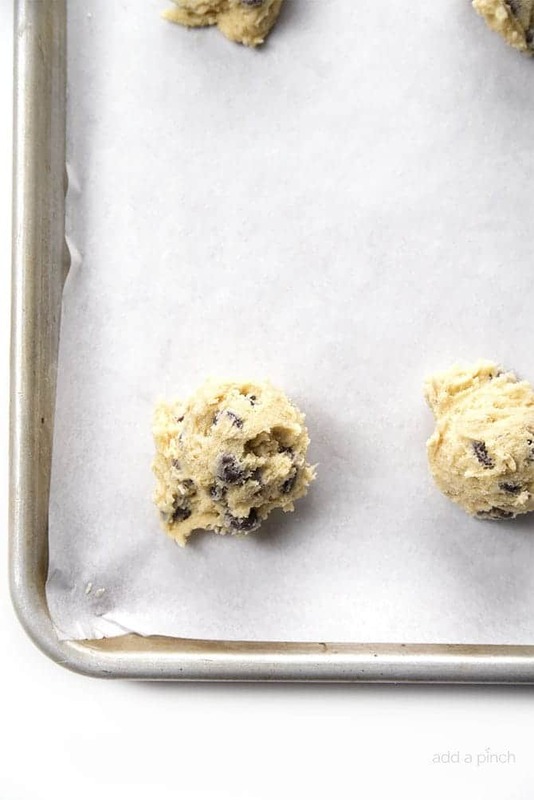 Scoop chocolate chip cookie dough onto a cookie sheet spacing well apart to allow room for the cookie to spread lightly. Bake for about 10 - 12 minutes or until lightly browned. Optional: sprinkle a pinch of salt onto cookies right out of the oven while still warm. How do you like your chocolate chip cookies? Crispy? Chewy? The perfect combination of both? I’d love to hear if you try this recipe. It’s yummy! 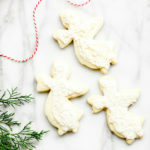 I’ve got coffee and no cookie to dunk — these would be perfect right this minute! They look delicious. Oh man, Maureen! You need to make these when you have plenty of coffee for dunking! slightly cripsy on the outside, chewy on the inside. I will teach your son how to eat his weight in cookies. I’ll bring the chocolate milk! 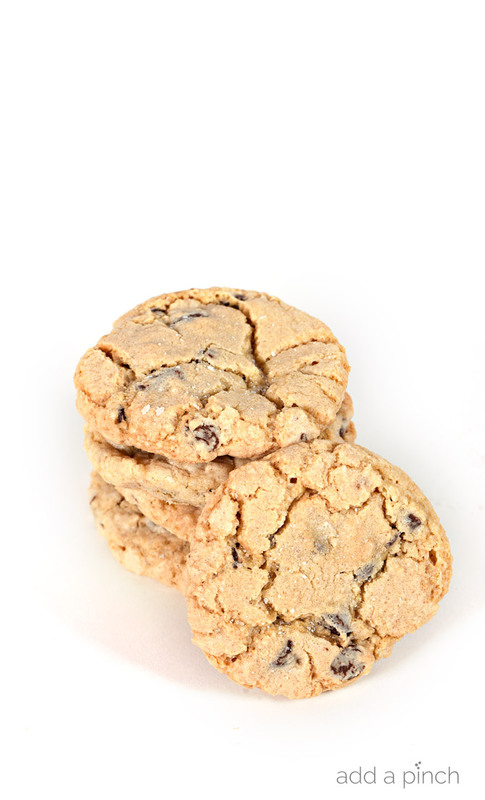 Chocolate chip oatmeal cookies have been a favorite in our family for so many years I can’t recall when we started making them. 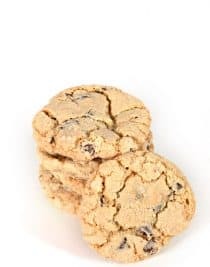 My kids never loved nuts in their cookies, I missed that extra mouthfeel of something beyond plain dough and the chocolate chip cookie seemed to be our ‘meet in the middle’ solution. Probably didn’t hurt that with the ever present issue of high altitude baking that the oatmeal in the dough help saved me from having totally flat cookies! That’s very rebellious, Barbara! I’m right there with ya though, toasted pecan bits would be heavenly! I love adding oatmeal to cookies. These look great! Thanks so much. Just a bit of oatmeal does takes these cookies over the top! These look perfect for dunking! Happy Baking! Happy baking to you too, Karriann! I love the idea of hiding some healthy oats in the chocolate chip cookies. well done! The combination of the slight crunch and chewy inside can’t be beat in my book. YUM! Thanks for the tip about the sea salt! You are going to love the addition of the sea salt, Amy! Ah-mazing! Oh, chocolate chip cookies are my absolute FAVORITE!!! These look divine! Love the combination of flavors with adding oatmeal to the mix. Looks delicious! i am just gonna . . . sigh . . . I just love me a good oatmeal cookie. And chocolate too? Sign me up! Those cookies look perfect! Perfect!!! These are one of my all time favs! Made these they flew out of the cookie jar!! And I have request from my kids to make more! I made these the other day with a friend. I also added some pecans (about 1/2 a cup) roughly chopped. They were great! I made various sizes and even wrapped some up for a friends birthday…his girlfriend said later he didn’t really eat cookies, but took one bite and then polished 2 (large) cookies off. Awesome recipe. I cut it in half for a smaller batch & they all came out perfect. I used Belgian dark chocolate that I cut up into chunks. I also used steel cut oats instead of the quick cook oats. These cookies are deelish! Thanks for the great recipe. Yum! I’m so glad you enjoy these. I hope you have a great weekend! Always on a search for the best chocolate chip cookie recipe, and I think I’ve found it! These were so delicious!! I used half white whole wheat flour and about a 1/4 cup of dark brown sugar because I was out of light brown. Also, I only have old fashioned oats so I gave them a quick pulse in the blender. YUM! My husband texted me from work to say how delicious they are. Mine baked up puffier than yours maybe from my changes. This is definitely a keeper! can you simply remove the oats? Absolutely. If the consistency seems to wet to you once you remove, I’d recommend adding in another tablespoon or two of all-purpose flour. If you wait (rest the batter) a bit for the oat fiber to absorb the extra moisture you speak of, the added flour won’t be needed. Patience, even in baking! You are a true genius Robyn. I’ve tried your cake recipes and I’ve just made a batch of these cookies. Every single one of your recipes I’ve tried have all come out heavenly! ? Great flavor combination, one of our all time favorites. This certainly doesn’t help with someone who’s trying to break their sugar addiction like myself. Looks delicious! Love these!! Please tell me your cookbook will be out soon! I made these cookies today. OMG…very yummy. I followed the recipe exactly and they are very tasty! I baked them for 10 minutes and let them sit on cookie sheet for 1 min. They were soft and baked perfect. I can’t wait to share with my kids, if there are any left. Making these right now and the first batch just came out of the oven. They don’t look like the pics, didn’t really spread out, but they are super yummy! Mines dd not look at all like the pictures and they rised like domes! 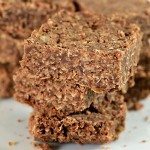 Try using 1/2 Tablespoon Walnut flavoring instead of vanilla, incredible! Looking for a 14 inch chocolate chip cookie cake recipe, this one sounds wounderful!!! I haven’t tried them yet, but cannot resist, so I will. But have a question. I saw a recipe last week for oatmeal choc chip cookies, and the oatmeal flakes were to be chopped quickly in a blender. You are my favorite goody maker, so what do you think? 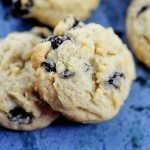 I have been searching for the best chocolate chip cookie recipe, and this is the best I’ve found online so far! Thank you Robyn for sharing. And thank you to Nate who discovered your coconut cream pie recipe and sent me here.